One major detail that will tie your space together is choosing the right flooring. Deciding on the material, color, and style is a very important step in the design process. 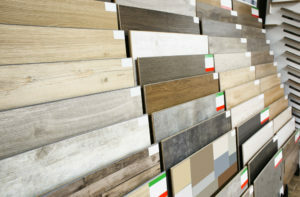 Our flooring specialists are here to assist you in choosing the correct materials for your space. Typically the bathrooms and kitchen are rooms that are prone to water damage and humid conditions. Choosing flooring that can withstand high levels of moisture and that can be durable enough is a major key to saving yourself money and potential issues down the road. Easy Maintenance– Nobody wants to spend most of their time cleaning floors. Kitchen and bathroom floors should be easy to spot clean or mop in no time. Style– Depending on the style of your home, or the specific you look you are wanting to achieve, you need a flooring that will tie it all together. Durability–The kitchen is the home of heat and spills and the bathroom gets a lot of traffic and humidity. If your floor can’t hold up throughout all the usual wear, you may find yourself needing to replace it a lot sooner than expected. Its best to begin with a flooring that’s tough, so you can love it longer. If you have doubts or are concerned with where to start and how to choose the best flooring materials for your space, contact our design team. 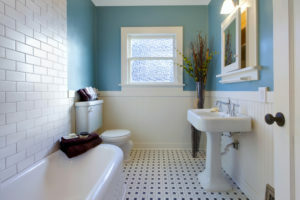 We will find the perfect flooring to complete your kitchen and bathroom remodel. Contact us today to schedule your appointment.